Some volunteers contribute many classifications and some only contribute a few. However, we take into account every single click on any of our projects, so all contributions are important and we are extremely grateful for them. 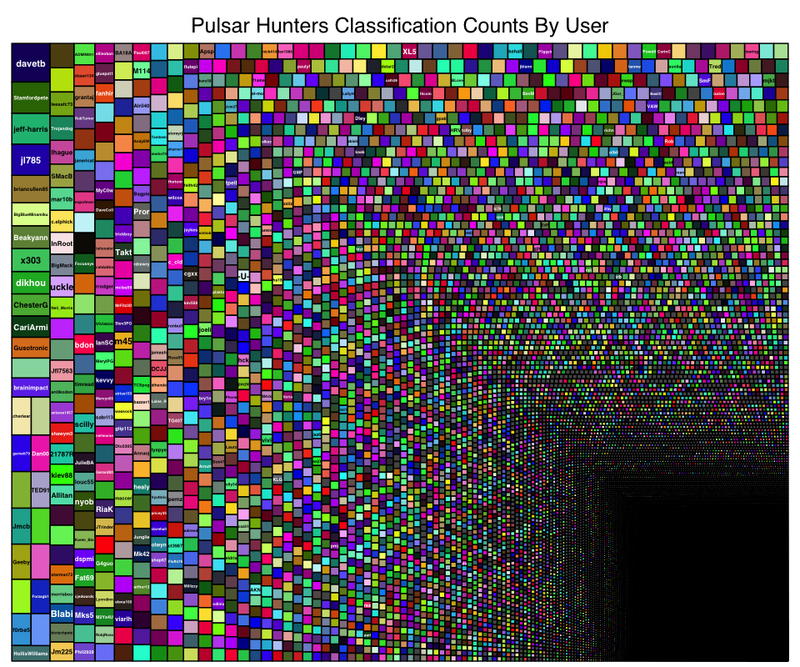 This plot (produced by the fabulous Dr Brooke Simmons) shows all 3 million clicks from the 55,616 volunteers who classified on Pulsar Hunters last week. The size of each square is in proportion to ho many images they looked at. The colours are chosen at random, except for the gray squares which represent unregistered users. Volunteer ‘davetb’ managed to analyse almost 10,000 images during the short life of the project! Thanks to all took part in Pulsar Hunters for making it a huge success.